One of the century's greatest and most influential thinkers, Karl Popper reminds us that we must recognize our responsibilities in preserving the democratic system we enjoy: it is our actions which will create the world of tomorrow. 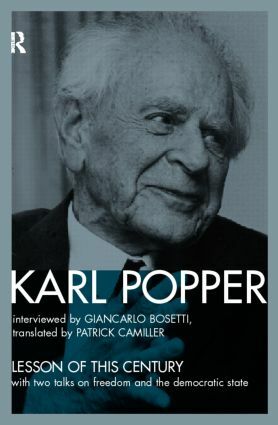 In these interviews with journalist Giancarlo Bosetti, Karl Popper ranges widely over contemporary political and social issues. He reflects on many topics, from the decline of the Soviet Union and the danger of a Third World War, to our obligations to children and the potentially harmful influence of television. He warns us that the increasing violence and egotism of our society, if unchecked, will imperil our civilisation. The volume also contains two talks on the theory of democracy, arguing that democracy has never been the rule of the people (nor can or should it be), but only the best method we know for preventing tyranny.